The8mm spindle is secured to the handle with a hex grub screw. 7mm spindleis available as a special order. Suitable for a door thickness of up to 48mm with adaption kits available forthicker doors. These are unsprung handles and require locks and latches with heavy dutyspringing. A range of suitable locks and latches can be found in the Locks &Security section. 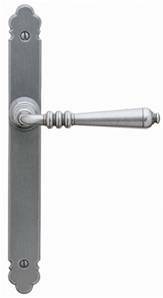 Theyare suitable for use with multipoint locking systems. The Black and Patine finishes are suitable for external use but our simplemaintenance instructions must be followed. Rust and brass finishes willtarnish over time when fitted externally.